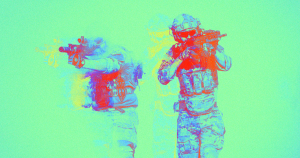 Some of the AR features are what one might expect from military goggles, like a built-in compass and targeting system, but Military Times tried out a prototype and reported back that the military’s AR goals are far more ambitious — signaling that the military’s ground troops could be in store for a major high-tech upgrade. IVAS is built on a custom version of Microsoft’s HoloLens headset. The headset is the end result of a $480 million military contract that Reuters reported — and which caused internal protests within Microsoft.